'If he’s a first-time spa-goer, start simple. 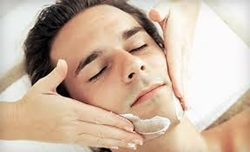 For men who may be a little weary of their first spa experience, stick to the basics,' suggests Gen Obolensky, owner and aesthetician at Botanica Day Spa. Choosing the perfect Father’s Day gift may not be easy, but Botanica Day Spa lends a hand this week with a variety of spa gift ideas for dad. The full-service day spa located in down town Clearwater highlights their spa treatments for men in a recent article, citing the gift of wellness as a perfect gesture for dads in Tampa Bay. “Although sometimes the world of spa treatments and relaxation may appear to be dominated by women, spa market trends tell us that this is not the case,” says Gen Obolensky, owner and aesthetician at Botanica. “In fact, CNN’s recent Confessions of a Male Spa Virgin points out that as much as a third of all spa-goers are men,” she adds. The male spa-going community has been catered to by some of the top spas around the world offering dedicated spa menus designed with men’s wellness in mind. Taking a cue from Hong Kong’s Four Seasons Hotel where half of the spa’s customers are men, Botanica is pleased to be offering guy-friendly services ranging from massage therapy to body treatments and facials. A simple yet powerful facial for all skin types, great for exfoliating away rough skin and deep cleaning the pores amidst a relaxing steam treatment. Because every massage client has different needs, Botanica’s therapists offer custom massage appointments. Simply let the therapist know if alleviation of tension, therapeutic muscle release or a relaxation-centric technique is desired. Complete with a foot soak, exfoliating treatment and a relaxing warm stone massage, the Botanica Pedicure is a simple yet deeply relaxing foot treatment—perfect for those who are on their feet all day. Botanica is open Monday through Saturday, with hours after 6pm on select evenings to cater to your busy schedule. To make an appointment, please call 727-441-1711 or schedule your appointment online today! Located in downtown Clearwater, Botanica Day Spa specializes in natural treatments for the body, skin and nails. Recognized in 2013 as first runner-up for Creative Loafing’s “Best of the Bay” awards, Botanica was voted first runner-up for Best Day Spa and first place for Best Mani/Pedi. Botanica was also voted “Best of Tampa Bay” for Brazilian bikini waxing, eyebrow shaping and therapeutic massage by CitySearch in 2010. With an emphasis on the use of organic and natural product lines in a cutting edge beauty services setting, Botanica’s staff is comprised of 12 fully licensed aestheticians, nail technicians, massage therapists and makeup artists offering a full menu of luxury spa services. The spa celebrates its twentieth year in business in 2014. For more information, please visit http://www.BotanicaDaySpa.com.